Work-related illness has become a common instigator for claims in the world of law. If your health has been affected by work, and your employer has not taken steps to improve your situation, you can now be entitled to compensation. –Insomnia: Displeasure with a boss or co-worker can affect sleep patters. –Anger and hostility: One of the most stressful triggers of any job is a major lack of control with how, where, when and with whom you have to work, which can cause negative emotions and irritability. –Anxiety, fear, depression, uneasiness: This can be caused by a number of triggers, and can lead to emotional and physical distress. Be sure to locate the sources and seek remedies to calm them. –You’re frequently sick: Germs are everywhere in the office so be sure it gets a proper clean and upkeep. If you are suffering from stress, you are also more likely to get ill.
–Noisy and deafening workplaces: Persistent exposure to loud noises may not only affect your hearing, they may also cause unnecessary headaches. –Overeating: If you have a desk job that keeps you pretty stagnant during the day, watch the foods and drinks you are consuming to ward off unhealthy weight gain. 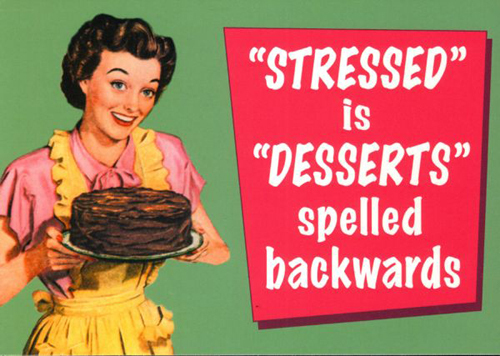 Overeating can also be a sign of stress, because of the hormones it unleashes, and the effects of high-fat, sugary “comfort foods” which push people toward overeating. –Carpal tunnel syndrome (sharp pains, tingling, numbness, and itching): Repetitive motions of typing, clicking your mouse, or answering your phone, can cause carpal tunnel syndrome. –Lower back pain: Sitting for hours with bad posture may have a terrible toll on your back and body. Again, pains and other physical symptoms can be caused by stress. –Workplace violence: Working in a hostile and tense environment e.g. disgruntled employees and customers, may start to take its toll on you, and you may start to adapt other people’s stress and attitudes. ← Happy 53rd Birthday Amnesty International!